Govinda Rosling, co-coordinator of the Pigeon Guillemot Research Group, is one of 60 volunteer citizen scientists who dedicate their time during the summer months to survey birds at 25 breeding colonies. The guillemots are an indicator species -- their health really echoes the overall health of the Salish Sea. Citizen scientists provide detailed information. They help us understand how human activities affect the ebb and flow of wildlife populations. Thank you, Govinda, & all the volunteers of the Pigeon Guillemot Research Group! It’s early morning on Whidbey Island in Puget Sound. We’re monitoring a colony of Pigeon Guillemots – black and white seabirds with bright red feet. How many birds are in the colony? What prey are they bringing to their offspring waiting in burrows in the cliffs? How often? Govinda Rosling, co-coordinator of the Pigeon Guillemot Research Group, is one of 60 volunteers who dedicate time during summer months to surveying birds at 25 breeding colonies. It’s their 9th season. For Govinda, the guillemots symbolize a place and a way of life important to her. Citizen scientists provide detailed information. They help us understand how our activities affect the ebb and flow of wildlife populations. Come join us on the beach! Peek into a burrow, or watch a Pigeon Guillemot -- a better swimmer than flyer -- land on the water in a kind of belly flop. See photos at birdnote.org. Bird sounds provided by The Macaulay Library of Natural Sounds at the Cornell Lab of Ornithology, Ithaca, New York. 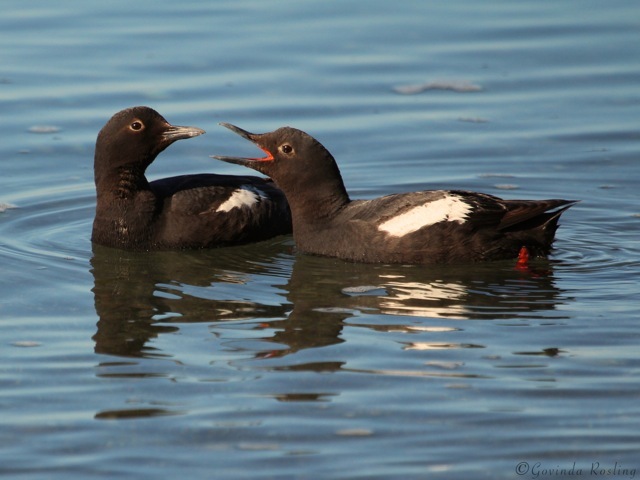 Calls of Pigeon Guillemots  recorded by Gerrit Vyn. Ambient PIGU calling and waves recorded by C. Peterson on site, MV Tracks 284 & 296. What's the Salish Sea? Find out!